Of the many bound prints from our Drawings, Prints & Graphic Design collection that were recently digitized, there are a few in particular that stand out. 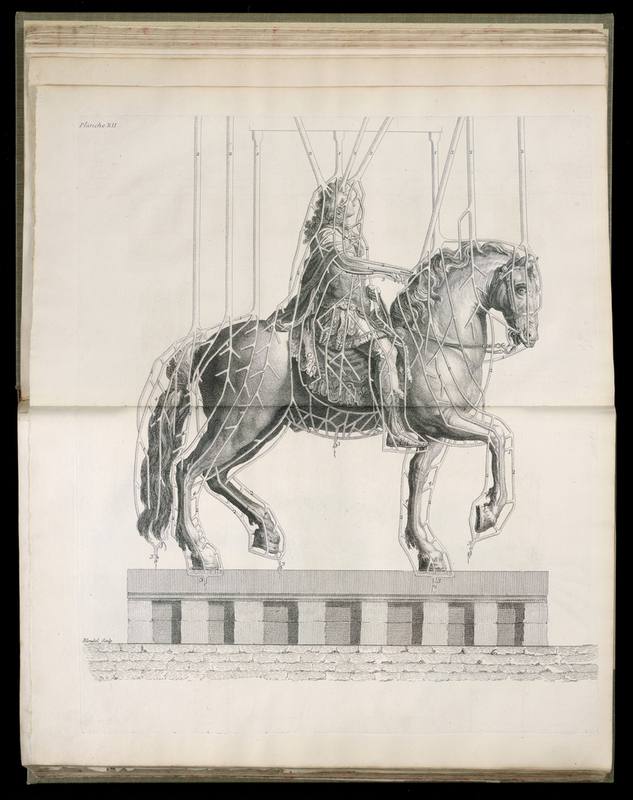 In these prints, French architect Germain Boffrand depicts the step-by-step process employed by Swiss founder Jean-Baltazar Keller to build a larger-than-life, 38-metric-ton sculpture of King Louis XIV on horseback, including the construction of a custom foundry in which to do the work. The sculpture, made public in 1699, was based on a smaller model made by the prestigious sculptor François Girardon twelve years earlier. It was displayed in the Place Louis le Grand, now known as the Place Vendôme (Wikipedia, Map) until it was pulled down in 1792 during the French Revolution. Smaller versions still exist today, including one at the Louvre and one in the Royal Collection. The prints come from a larger book, in which Boffrand describes each step in great detail. After describing the building in which the casting would happen, Boffrand explains each part of the lost-wax casting process. First, the original wax sculpture is molded in plaster. Next, an armature is constructed out of iron and wax is poured around it. This wax cast is augmented with wax rods which will act as channels for air to escape when the final bronze cast is made. This piece is further encased in plaster and heated so that the wax melts out and bronze can be poured in. The video below, from the Victoria and Albert Museum, shows the lost-wax casting process on a smaller scale. This video contains one key difference however, which is that Girardon’s sculpture was constructed entirely in one piece, an engineering feat that had never been accomplished before for a sculpture of its scale. Et voilà! One regal sculpture, à la carte. Sam Brenner is an Interactive Media Developer in the Digital and Emerging Media department at Cooper Hewitt, Smithsonian Design Museum.